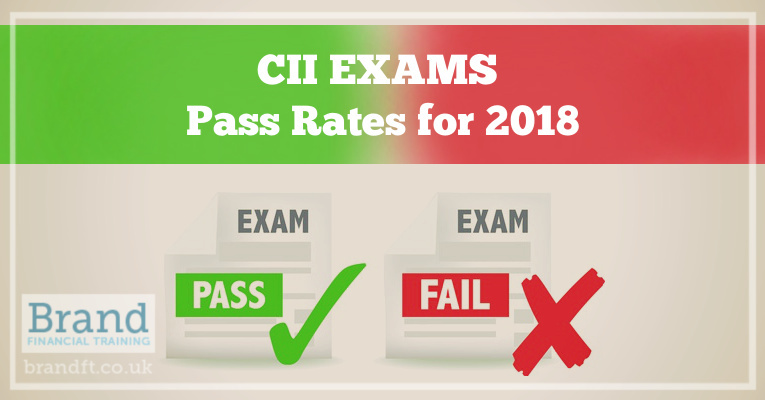 The CII exams pass rates have now been published for the 2018 exam sittings. 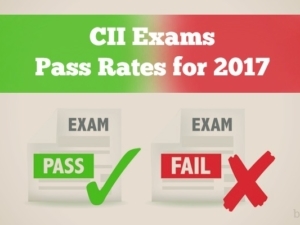 Here, we look at a selection of CII qualifications and their exam pass rates. Those who are planning to sit CII exams in the near future will want to know how past exam candidates have fared. 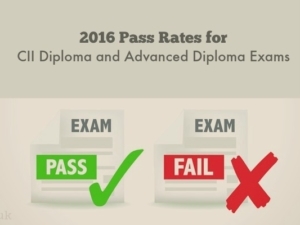 Looking at the Diploma first, the 2018 figures show pass rates range from 48% to 85.94%. J10 (Discretionary investment management) had been consistently showing an improvement until 2018 when it dropped back, albeit only slightly, and it still holds the top pass rate position with 85.94%. The written exam with the lowest pass rate once again goes to J11 (Wrap and platforms) with only 50% of candidates getting through (although this is an increase from 2017). J09 is the paraplanning coursework module and this has a surprisingly low pass rate of just 48% (although we have no figures from previous years to compare this with). Other subjects saw good increases, in particular J03 (Tax and legal aspects of business) rising from 50% to almost 60%. 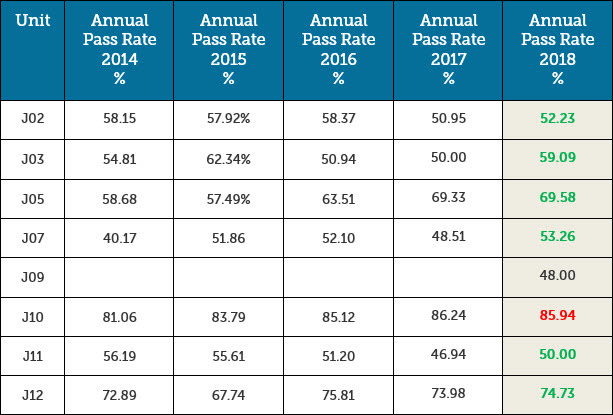 The figure in red shows the only example where the pass rate dropped from 2017, and the green figures show where pass rates have increased from the previous year, which as you can see, applies to all of the rest of the written papers. For the R0 units, the numbers are, as usual, mixed with four subjects showing an improvement from 2017 and four going down. Once again, the numbers passing the pensions exam (R04) went up, and almost more encouragingly after a few years of dips, R03 (personal taxation) finally shows an improvement jumping from 48.71% to 52.55%. With the advanced subjects, we can see once again a decent rise in delegates passing AF1 (Tax and trusts). AF3 (Pension planning) is showing a big drop in 2018, but this exam has now been withdrawn. The numbers for AF2 (business planning) crept back up again, but we can see a further drop for AF4 (Investment planning); for the last two years, AF4 pass rates have dropped markedly suggesting this exam has got a lot tougher than it already was. Also, AF5 (Financial planning process) numbers have dropped again, so another exam getting harder to prepare for. In summary, all but one J0 exam saw an increase in the numbers passing. The multiple-choice R0 exams weren’t quite as good with an equal number of reduced and increased pass rates. The written paper R06 (Financial planning practice) saw more than a 4% increase in numbers passing. 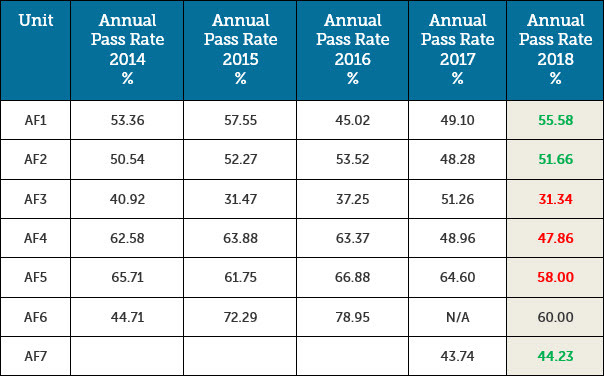 It’s interesting to see that, excluding AF3 (Pension planning), which only had one sitting in 2018, AF7 (Pension transfers) continues to have the lowest pass rate, albeit it has increased slightly from last year. For reasons unknown to us, AF8 (retirement income planning) figures have not been published.